Heber City’s mayor addressed members of the Heber Valley Chamber of Commerce in the first ever state of the city address on Tuesday. You can find the entirety of the address at KPCW.org here. Heber Mayor Kelleen Potter addressed members of the Heber Valley Chamber of Commerce at their monthly lunch meeting on Tuesday at the UVU Wasatch campus. Mayor Potter started her speech discussing what the city considered victories throughout the year including growth of office space in town, growth of the healthcare industry as well as retail and housing. Mayor Potter spent a large portion of her speech discussing transportation in the valley. Mayor Potter said that they plan to make the Airport Master Plan Update very transparent and public. The city is losing FAA funding because they have not updated complied with the requirement of updating the Airport Master Plan. Mayor Potter also discussed the success of the Heber Valley Railroad and plans to create a new storage building that can hold 15 train cars to protect them from vandalism and the weather. The final transportation discussion point was regarding Heber’s Main Street. 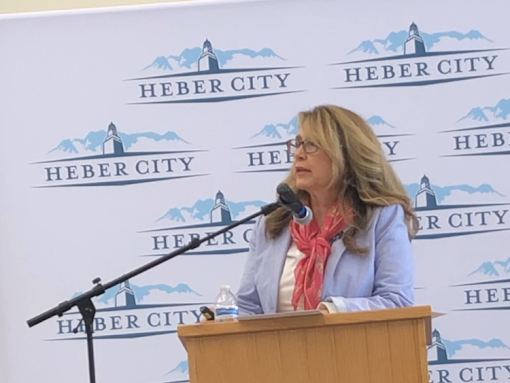 Mayor Potter emphasized the role Heber’s Community Alliance for Main Street, or CAMS, is playing in the city’s work to take back Main Street. She said that they are anxious to start an environmental study looking at the bypass/parkway study so that the route can be established. Mayor Potter also discussed the Heber Light and Power project that will result in powerlines running through the northern portion of the Valley. She said the board looked into burying the lines but at four times the cost of putting them overhead the board decided against it although they are willing to work with any entity that wants to pay the difference in any area where the powerlines will run. Mayor Potter mentioned other mitigation efforts for the project. She also mentioned that Heber Light and Power will be reaching out to the public soon to see if citizens would want to change the energy resource mix the utility uses. Mayor Potter closed her address by inviting citizens to become involved with the general plan update, which will serve as a blueprint for city officials in the coming 30 years. You can find the entire address here. We believe the best jobs are close to home. Our mission is to bring job seekers and employers together on the Wasatch back in Park City and Heber Valley. Take a closer look — your future is local.